Normandy is veritable open-air museum. Back to Normandy brings all (with your help!?) museums and places of interest and remembrance connected with D-Day together and the ensuing offensive of the Allied Forces in the three departments of Calvados, Manche and Orne. 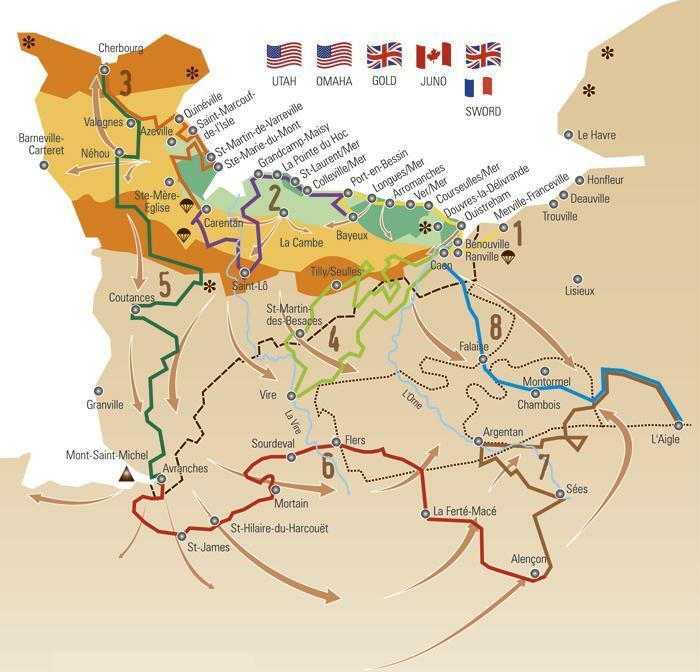 Eight itineraries in chronological sequence clearly signposted “Normandy Terre-Liberté”, enable to visit or to discover this history packed places and to follow the unfolding of this huge battle on which the outcome of Second World War depended. See the map by www.normandiememoire.com with an overview of the itineries. 1. Overlord-l’Assaut (the Onslaught): 70 km from Pegasus Bridge to Bayeux via Sword, Juno and Gold Beach. 2. D-Day-le Choc (the Impact): 130 km from Bayeux to Carentan via Omaha Beach and Saint-Lô. 3. Objectif un Port (Objective a Harbour): 95 km from Carentan to Cherbourg via Sainte-Mère-Église and Valognes. 4. L’Affrontement (the Attack): 207 km from Bénouville to Caen; this itinerary completes the first one. 5. Cobra-la Percée (the Breaktout): 155 km from Cherbourg to Avranches via Coutances. 6. La Contre-Attaque (the Counter Attack): 162 km from Avranches to Alençon via Mortain. 7. L’Encerclement (the Encircling Movement): 145 km from Alençon to l’Aigle via Chambois and Mont-Ormel. 8. Le Denouement (the Outcome): 122 km from Caen to l’Aigle via Mont-Ormel and Vimoutiers. Visit the history of the Normandy Landings and Normandy Battle by following the signposts (see the 8 links) through Normandy. Eight maps - with a short video introduction about what happened on this route - will show you the details as they are written on Back to Normandy. Scroll down under the video to see the cities mentioned on this route. You can always use the the map search function to find out the historical details from your specific search, somewhere in Western Europe.